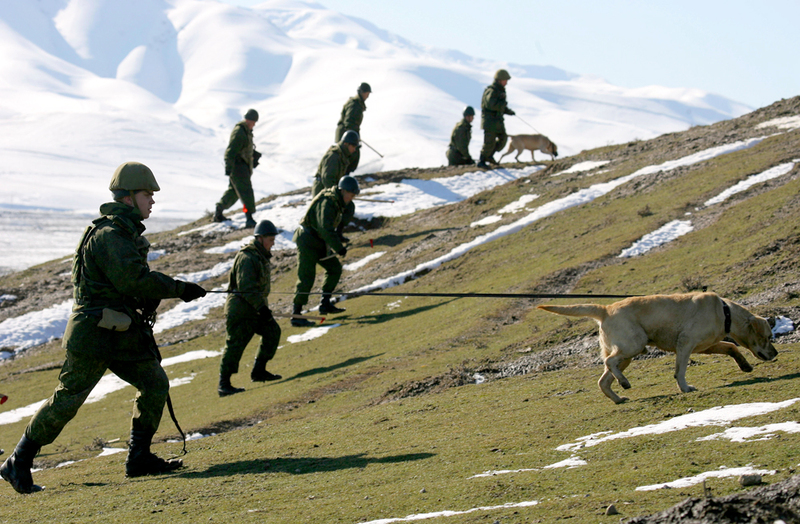 Russian servicemen walk during an operation to search for unexploded military shells, which were used during previous military war games, at the Lyaur firing ground of Russia's military base number 201 outside Dushanbe, Jan. 17, 2012. Locals in Tajikistan are worried about the possible reduction of Russian servicemen in the country, as the Islamic State militant organization grows in strength in neighboring Afghanistan. Tajiks have expressed concern about the possible reduction of servicemen at Russia's 201st base, which is located in Tajikistan, fearing that it could open the way for Islamic State militants to enter the country from neighboring Afghanistan. This contingent is the main stabilizing factor for Dushanbe and if the militants ever invaded Tajikistan, it is likely the country would fall apart. The redeployment of the Russian divisions became public in the middle of November when the Central Military District announced that the 149th motorized regiment would be moving from the town of Kulyab to a suburb of the capital Dushanbe (the Lyaur firing range). The 201st Russian military base is located in the Tajik cities of Dushanbe (the capital), Kulyab (in the south-eastern part of the country, until 2015) and Kurgan-Tyube (in the southwest). "The redeployment had been planned and has already been approved by the Republic of Tajikistan's Defense Ministry," said the announcement. At the end of January it was announced that during 2016 the number of military personnel deployed at the 201st base would be reduced. According to a source close to the Tajik government, Russian servicemen will soon be able to leave the base in Kurgan-Tyube. They will also be moved closer to Dushanbe. The redeployment in Kulyab was considered the most serious due to the threat of militants invading from neighboring Afghanistan. It is only 70 kilometers from Kulyab to the most Afghanistan’s restive northern province of Kunduz. The "optimization" of the Russian contingent is making locals anxious. Every week on the Afghan-Tajik border (which stretches for 1,344 kilometers) there are clashes with smugglers. Last year the Tajik National Security Committee reported that there were between 4,500 and 5,000 militants on the border. Locals say that in the event that Islamists break into Tajikistan, Russian soldiers are the only hope. The Tajik army will not withstand an invasion of 5,000-7,000 heavily armed militants, while the Russian servicemen who have left Kulyab will not be able to react in time. The reductions come amid constant announcements about the growing threat of ISIS units invading post-Soviet Central Asia from Afghanistan. "There are now all the presuppositions to confidently say that there are ISIS units just over the border, and now, in addition to everything else, we are faced with more dangers," said Russian Defense Minister Sergei Shoigu in December. However, a source from the Russian Defense Ministry has responded to Tajikistan's fears by saying that Moscow has only slightly reduced its contingent in the country. In his words, it is not necessary for Moscow to keep a regiment in Kulyab when at any time it can be deployed there using aircraft. Central Asia expert Arkady Dubnov offered a political interpretation of the Russian contingent's redeployment in Tajikistan, which has so worried Dushanbe. It may be seen as a move to put pressure on Tajik President Emomali Rahmon to enter the Eurasian Economic Union and agree to have Russian border troops return to the Afghan border. "The risk of Islamists breaking in from Afghanistan is not very big, given the fact that the country is home to mainly Talibs. Both Moscow and Dushanbe understand this and are therefore playing this game of nerves to see who will give in first," explained Dubnov. In any case, for Russia control of Tajikistan's border with Afghanistan is still important for countering drug trafficking, contraband and the flow of extremist mercenaries.